FC Cincinnati (FCC) drafted The Motz Group to deliver multiple high-performance soccer fields at their new professional training facility, Mercy Health Training Center. Located in Milford, Ohio and schedule to go online in February 2019, the MLS team’s facility includes two stabilized natural grass surfaces and one synthetic turf surface, as well as a goalkeeper-specific training area. From the early stages of planning, FCC has been committed to building the best soccer-centered training complex in the country. With a clear focus on having world-class playing surfaces, FCC management sought a sports field partner who had the proven ability to deliver on their vision. Headquartered locally, with over 40 years in the industry, The Motz Group has an impressive list of high profile clients, and an internationally recognized portfolio of products, the choice was simple. The Mercy Health Training Centerwill feature over 250,000 square feet of Eclipse®Stabilized Natural Turf. For more than 20 years, Eclipse has been one of the most proven hybrid turf technologies in the world. Seen in the USA, Europe and across Australasia, Eclipse delivers a lush, 100% natural grass surface rooted in a synthetic fiber mesh. The system provides enhanced vertical and horizontal stability required by MLS teams, while optimizing wear tolerance and playability. The facility will also offer a SportGrass® Synthetic Turf System, designed specifically for sports like soccer where ball-to-surface interaction is critical for play. This synthetic turf field, infilled with a sand rubber mixture, has been manufactured with broad monofilament fibers for increased aesthetics and extended performance. This surface will offer back-to-back play, even during or after a rain event, helping keep FCC’s training schedule on track. Since arriving onsite in October, Motz has completed the SportGrass synthetic turf field, as well as a majority of the base work for the two Eclipse surfaces and goalkeeper-specific training area. The crew officially began installing the first of the Eclipse rolls in late December 2018. The Mercy Health Training Center’s athletic surfaces will be ready for action this year. “The Motz Group is honored to be FC Cincinnati’s turn-key, natural and synthetic turf field provider at Mercy Health Training Facility. FC Cincinnati’s rapid impact on the international soccer community has been a huge source of inspiration and pride for everyone in the Queen City. Motz is excited to partner with our hometown club and bring our world-class innovative products and service approach to MLS,” said Zach Burns, President of The Motz Group. FC Cincinnati is a professional soccer team that will begin play as Major League Soccer’s 24th team in 2019. The club’s ownership group is led by majority owner Carl H. Lindner III and also includes Scott Farmer and George Joseph. Launched in 2015 by Lindner III and current President and General Manager Jeff Berding, FCC began play in the USL in 2016. The club won the 2018 USL Regular-Season Championship in record-setting fashion, and earned postseason berths in all three of its USL seasons. In 2017, FC Cincinnati also advanced to the semifinals of the Lamar Hunt U.S. Open Cup that included pair of victories over MLS squads. The team currently plays its home games at the historic Nippert Stadium on the campus of the University of Cincinnati, and has started construction on a soccer-specific stadium in the West End neighborhood of Cincinnati that is expected to open in early 2021. Follow the team on social media on Twitter, Instagram, Facebook or YouTube, or visit the club’s official website: fccincinnati.com. 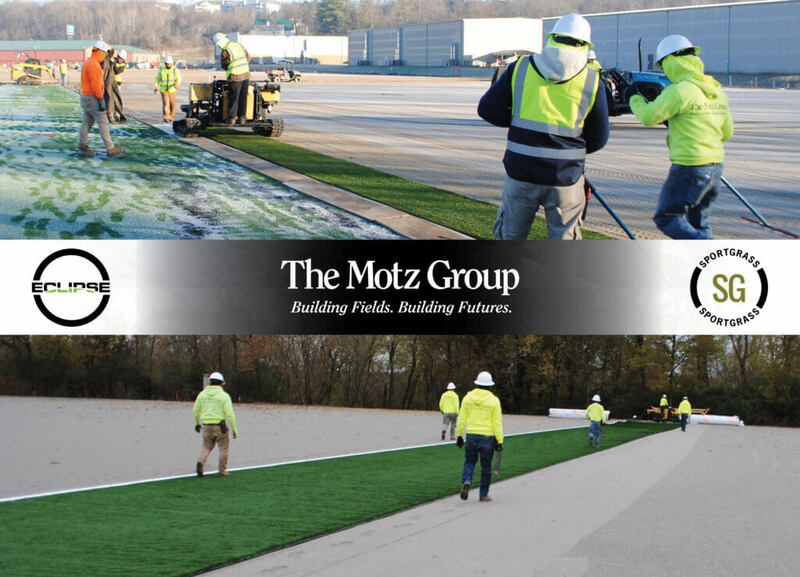 The Motz Group has been building world-class sports fields both nationally and internationally for over 40 years. They’ve earned their global reputation with trailblazing innovation and an uncompromised commitment to quality. Motz specializes in high-performance natural and synthetic sports field design, construction, removal, replacement, maintenance and management. Athletes have competed on Motz’s surfaces in the NFL, MLB, NCAA, MLS, Olympics and World Cup. Their globally recognized products include the world-renowned hybrid turf system, Eclipse® and the comprehensive natural grass root zone management system, AirPAT®, as well as a line of pro-grade synthetic turf systems. For more information, please visit themotzgroup.com.